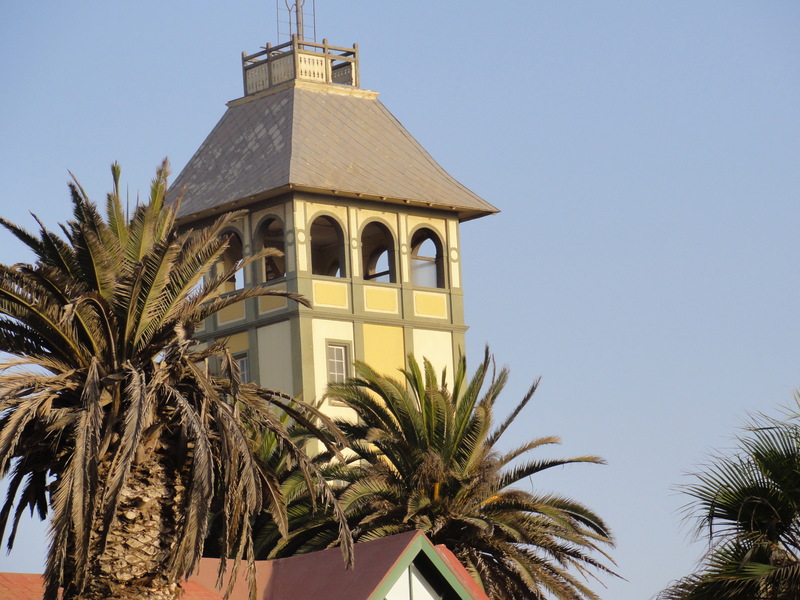 There aren’t many towns that offer quite as much to the traveller on foot as Swakopmund. The historic town is located where the desert hugs the Atlantic Ocean, north of Walvis, and was the original settlement of German colonists. 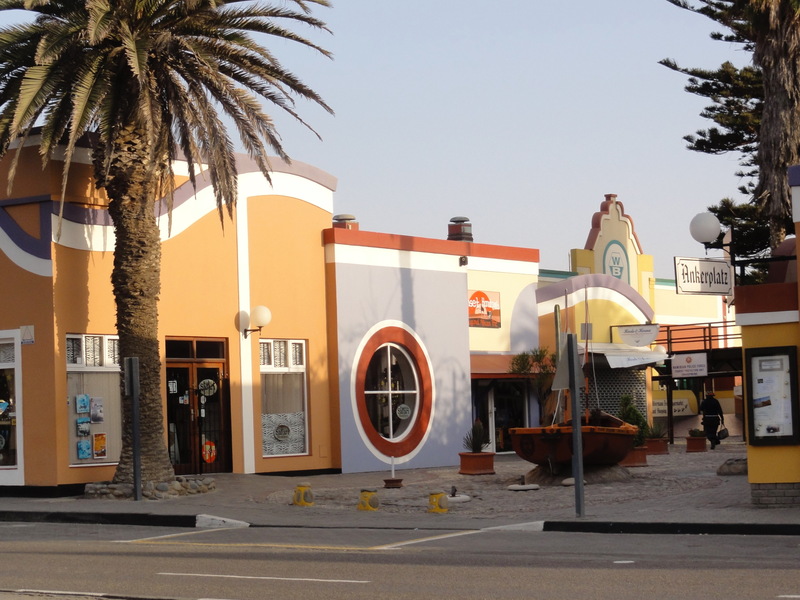 Swakopmund has a distinctly quirky style that managed to survive even with its growth in size. A walk along its roads reveals little treasures that are easily overlooked otherwise. 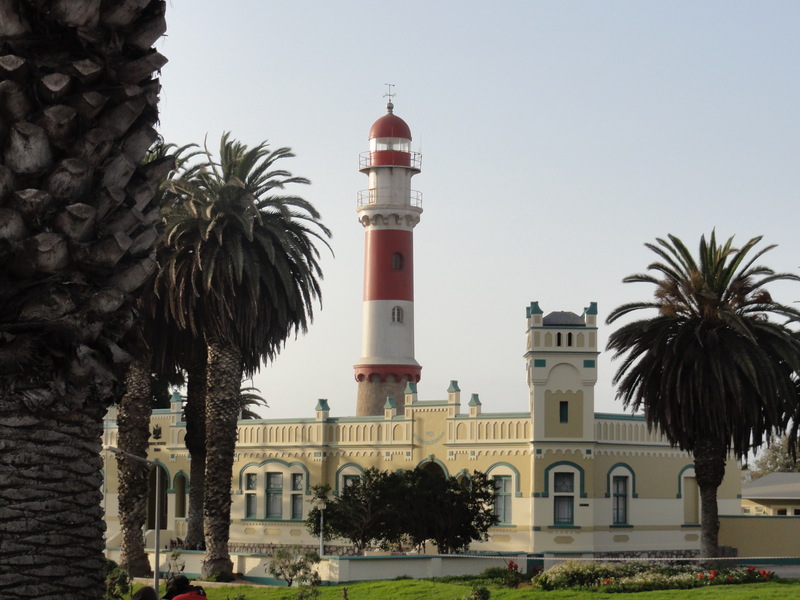 Make a trip of it and take our walking tour to get the most out of Swakopmund. 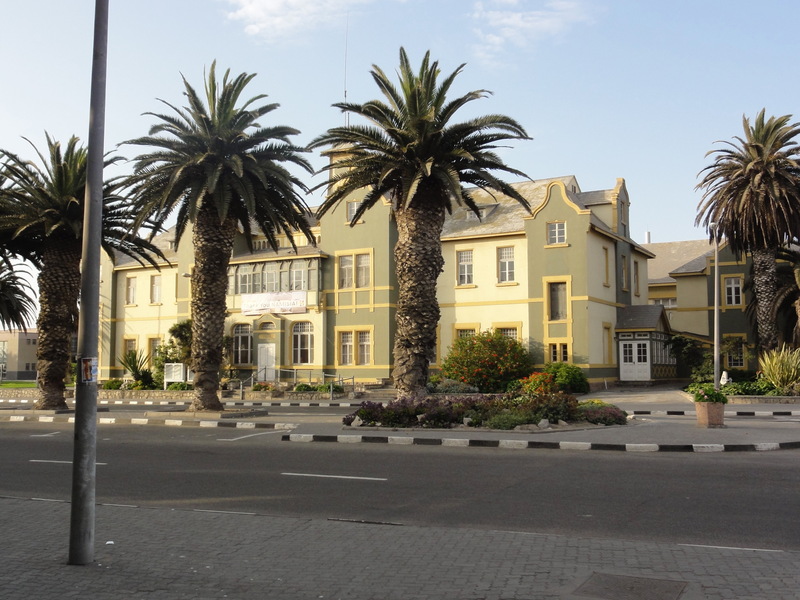 Start at the Swakopmund Hotel and Entertainment Centre. Appreciate its peculiar “witch’s hat” roof and elegant design. The building was completed in 1902 and for many years served as the railway station, although these days it has a more luxurious use. Walk down Otavi Road towards Daniel Tjongarero Ave. On the corner to your left is Namib High School, a beautiful structure from early in the previous century, that stretches out halfway along the length of the block, only to be followed by a nondescript modern structure that completes the school’s premises. Across the road is the second oldest building of the Lutheran church in Namibia, built in 1912, with stained-glass windows donated by the town of Bremen and the original organ from Stuttgart. If it’s open, take a look inside to see the full effect of the glass work. From the street corner at the school, turn right and go along Daniel Tjongarero, which is filled with more colourful architecture worth a glance, such as Dr Schwietering House, now a quaint hotel known as Villa Margherita, the municipality buildings on your right, and the old Hansa Hotel on your left. As you near the end of the street, you should see people mingling about on the corner, seated at outside tables littered with coffee cups and saucers. That’s SlowTown, where time stands still over a warm brew. Join the peeps for a little break and then continue your exploration. From SlowTown, keep following the road as it veers left and turns into Tobias Hainyeko Street. To your right is a photo studio located in a quaint building called Freudhaus. On the same block is the Artist Arcade, where you’ll find locally made knick-knacks and presents to take back home. A little way further is the entrance to another arcade at the left. A stop at Die Muschel on the corner is great for bookworms, or else snoop around and snuffle along the shop window displays as you wander along the walkway. Have a beer at the Brauhaus, situated right in the centre of the courtyard, where it’s almost impossible to find a seat during summer holidays. When you’re finished, come out again to Tobias Hainyeko Street and continue left. Now, avert your eyes as you walk past the horrific modernist structure that is the Standard Bank building, standing out like a sore thumb. Enjoy the town’s centre as you continue along the street for two more blocks. 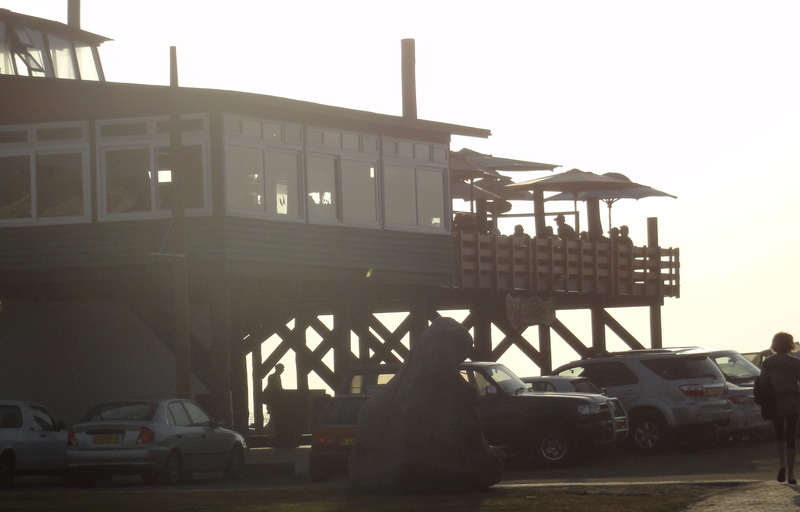 The Tug Restaurant at Sunset, Swakopmund. By now the street should be a little less busy. 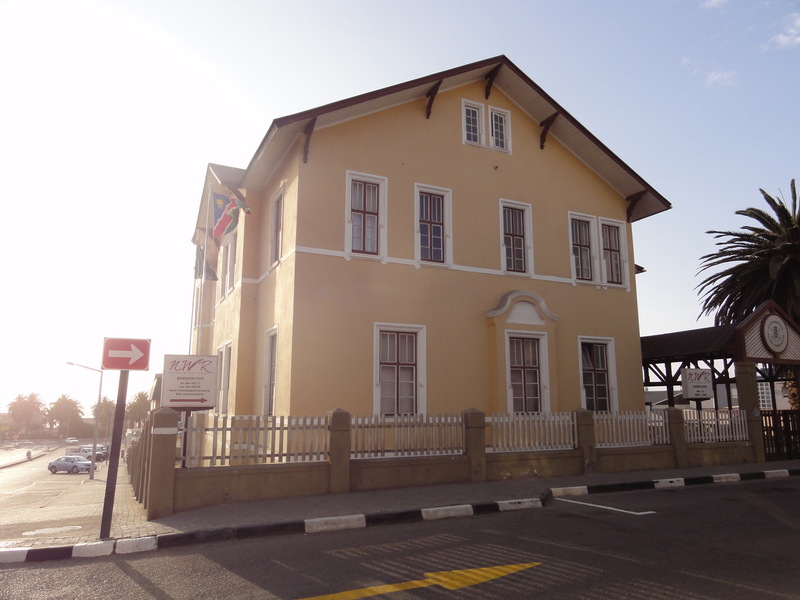 The atmosphere at the corner of Tobias Hainyeko Street and Libertina Amathila Ave is calmer, as across the road is the elegant Atlas House, or Höhenzollern Building. It is a national monument, and for good reason. In the olden days, however, it was a notorious gambling house. Atop sits poor Atlas holding the world precariously on his shoulders. Try to catch his attention, but please don’t let him lose his concentration. The best moment to view the building is when the light hits it at sunset. Then look down at the ocean at the bottom of the hill—it’s calling you towards it. As you move further into Swakop’s northern residential area, the houses become smaller and more nondescript. But there are still a few gems worth looking out for. Notice the two cute colonial houses on your right before Europahof Hotel’s stark black and white structure on the corner. Turn right at the corner of Bismarck and Anton Lubowski and continue down towards the rumbling sea. The street then comes to an end and Strand Street flows past. Across the road is your chance to dip your toes in the water, or continue on. 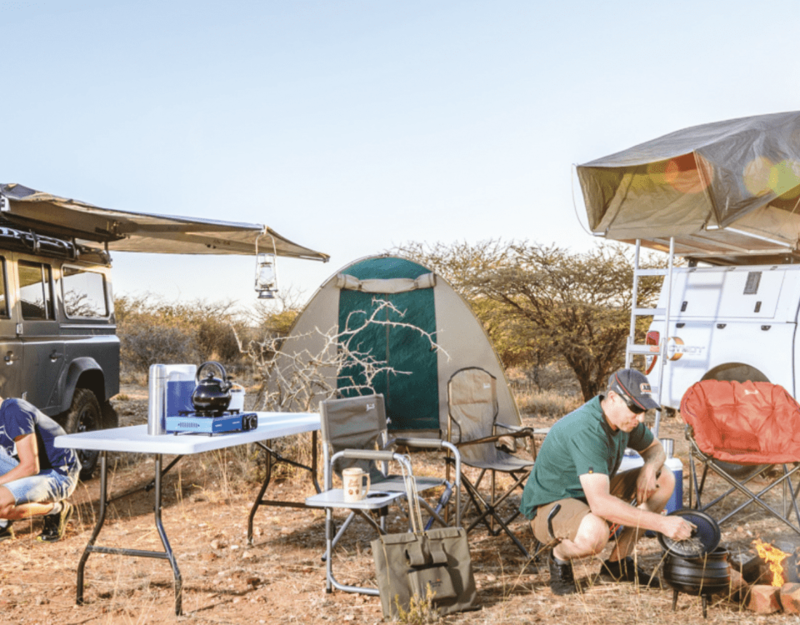 At the corner of Sam Nujoma and Bismarck Street on your left is the Namibia Wildlife Resorts Building. The windows seem to hold long-lost memories; try to spot a ghost if you have the nerve. To the right is the Woermann building, named after the shipping company that transported goods and people between Germany and its colonial port. Come closer to the door and notice the little pictures of ships on the wall. The corner of the building is now a public library, however, it is not as impressive inside as out. Walking around the NWR building, turn left into Bismarck Street, where suddenly the street is shady, and up ahead is the famous Hotel Schneiderhaus and even better, Café Anton. Grab a few biscuits or confectionaries for tomorrow’s trip. From the benches outside the café is a pretty good view of Swakopmund’s summer State House, which looks as if it is straight out of a sci-fi movie (and was, in fact, one of the many locations for the sci-fi series, The Prisoner). From the corner of Café Anton, follow the steps two flights down and across the road toward the activity up ahead, which is where the Mole (a big rocky breakwater) starts. Follow the pathway over the lawn and notice on the left the War Memorial dedicated to German soldiers from both World Wars. As you amble along you’ll be able to spot the ocean shimmering up ahead in the distance. The Mole is a fantastic spot to find a bite to eat, especially with that view. Grab a chair and relax for a bit before the last stretch. And when you’re done, amble along the walkway that leads up toward the look-out point. Relax on the benches and watch the seabirds go about their daily activities and enjoy the sea salt spray on your face. From the look-out point, retrace your steps to where the parking lot of the hotel starts, walk up the steps and walk around the hotel to the street entrance. There you should find the start of the Promenade, a walkway lined with trees that runs parallel to Strand Street. Wander along the pathway and when the shade of the trees starts to open up around you, look ahead to your right and there, over the waves, is the Jetty. The Jetty was renovated a few years ago, thank goodness, after many years of being unusable. Perched at the far end is a restaurant where you can see the green waves through a glass floor under you while enjoying a drink as the sun sets. A perfect end to a perfect day. 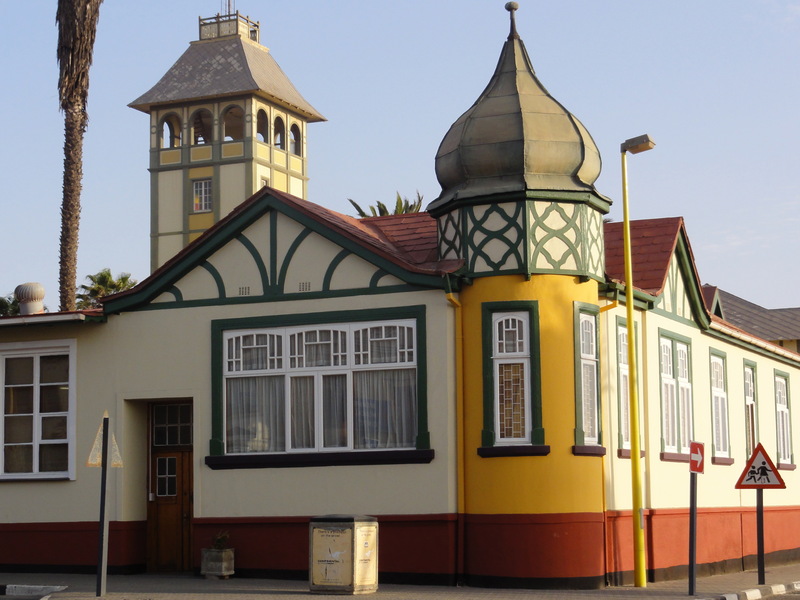 Read more about historical Swakopmund here. Hohenzollernhaus ist en Swakopmund, jah?